Join Us on a Great Adventure for the Lord! The Lord of the harvest needs workers in His vineyard! Will you answer His loving call? Download our postulant application in PDF format! During aspirancy, the young man is introduced to our Eucharistic-Marian-Papal-Franciscan spirituality by spending time with us and participating in our work and prayer. There is no commitment yet, and the aspirant is free to leave at any time. As a candidate, the young man participates more fully in community life. If he feels called to remain, he can make a short-term promise to continue in the community until Holy Thursday or October 4th, the Solemnity of St. Francis, whichever comes first, when, God willing, he will become a postulant. The postulant continues his transition from secular life to consecrated life, begins his formation in the particular spirituality of the Knights, and receives the instruction and assistance he needs to make a prayerful, mature choice about his vocation. The novitiate is the principal phase of formation as the novice enters more fully into the community. Under the guidance and care of the Vocation Director, the novice learns the responsibilities of community life; practices the evangelical counsels of chastity, poverty, and obedience; and grows in knowledge of his divine vocation (whatever it may be) and of the Knights. The Juniorate is a period of formation that lasts the whole time of private vows. During this time, the Knight affirms his voluntary commitment made to God. Through human, spiritual, religious, and apostolic formation, he prepares that he may better serve the Church as a Knight. At the same time, he strives to reach the personal maturity necessary to make his final profession of vows if that is God’s will. When the time of private vows has been completed and the Knight is wholly dedicated to his mission and sufficiently understands what he will be undertaking, he makes his final profession of the vows of poverty, chastity, and obedience, committing to remain in the community for life. He strives ever more to live out his calling and grow in holiness. 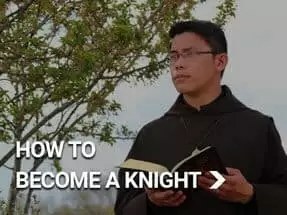 Are you called to be a Knight? The consecrated life is challenging yet joyful and rewarding at the same time! The Knights exist to serve the Church and the wider community by prayer; adoration of the Most Blessed Sacrament; and a wide-ranging variety of apostolic works, including training altar servers, giving spiritual talks, online evangelizing, and assisting the poor. Our life is a balance of work, prayer, and free time/recreation (think fun!) lived in community. We treat one another as brothers, and our fraternal life gives each individual support on his heavenly journey. “A religious community is a gift of the Spirit. It is the love of God, poured into our hearts by the Holy Spirit, from which religious community takes its origin and is built as a true family gathered together in the Lord’s name” (Fraternal Life in Community, Congregation for Institutes of Consecrated Life & Societies of Apostolic Life). One of our important duties is serving Holy Mass, which we do as reverently as we can. The Knights are blessed to serve Mass in both forms, the Ordinary Form and the Extraordinary Form (Traditional Latin Mass). “This is the meaning of the call to the consecrated life: it is an initiative coming wholly from the Father, who asks those whom he has chosen to respond with complete and exclusive devotion. The experience of this gracious love of God is so deep and so powerful that the person called senses the need to respond by unconditionally dedicating his or her life to God, consecrating to him all things present and future, and placing them in his hands” (Vita Consecrata 17). 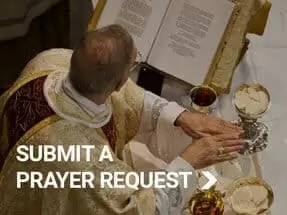 Take a brief survey to see if a vocation to the Knights of the Holy Eucharist is for you! What are some of your interests and personal characteristics? How important is the Catholic faith to you? What is your state in life? Do you have an interest in becoming a religious Brother? Hmmm... I haven't really thought about it, until now. 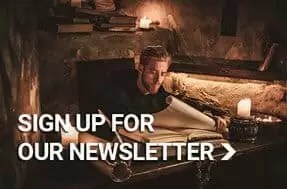 Yes, I've thought about becoming a Brother. I would like to seriously look into becoming a Brother. I'm not only serious, but have contacted at least one other religious community about becoming a religious Brother. Do you find yourself saying, “I want to give myself totally to God”? Not really Yes, this expresses my feelings right now. Are you drawn to prayer? Not really... I don't get to church much. I have only a small interest in prayer. Yes - prayer and the Mass are things that are really important to me, and which I appreciate. How do you feel about wearing a habit as a religious Brother? Um, I’d feel more comfortable just wearing jeans and that type of clothes. Wearing a habit such as the Knights’ would be just fine. Do you have any school debt, car payments, or other debt? No debt at all. I have some outstanding debt - under $5,000. My debt is more than $5,000. What about other aspects of religious life? The vows of poverty, chastity and obedience seem too overwhelming. The religious vows might be a challenge, but they don’t seem out of the question. What do you think of community life? I've had problems living with siblings, roommates, or others, and don't want to face this again. My experience hasn't been perfect, but I can see how living with other religious could grow into life-long friendships. My health is fine. I have a physical handicap or chronic illness, which presents some difficulty in my day-to-day life. I’m taking psychiatric medication, such as anti-depressents. Have you prayed about a vocation to religious life? I haven't really prayed about this. I've prayed about this, but so far God hasn't made an answer clear to me. In prayer, God seems to speak to me in a positive way about religious life. Do you think you might have an interest \in a life of prayer, living in community, and doing manual labor? No, this is not my area of interest. Yes, I can see the value of serving Christ in this way. Do you have a spiritual director – one who guides you in discerning your vocation? Um, no. No, but I would like to find one. Yes, I have a spiritual director. Would you be willing to come to visit our house in Waverly, Nebraska (just outside of Lincoln) for a while to see what our life is like? Not right now. Contact me in 6 months Yes, I'd be interested. Tell me what's involved.